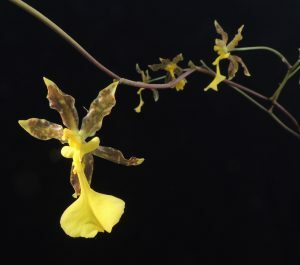 This is the first time we have featured this dramatic cool growing Mexican species. 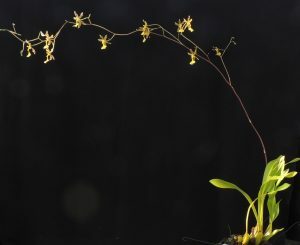 As you can see from the photo above the species produces very long branched spikes(this one is 2.5m long)with large flowers spread quite sparsely. The delicious sulfur yellow lip is really striking and has lead to this species being used successfully in breeding interesting hybrids. The species is found from 1600 to 2500m in cool oak forests which experience much wetter summers than winters but we find plants don’t appreciate dying out to much in the winter although good drainage in a basket seems to suit them best. The spikes are pretty much self supporting and we like to let them arch naturally.